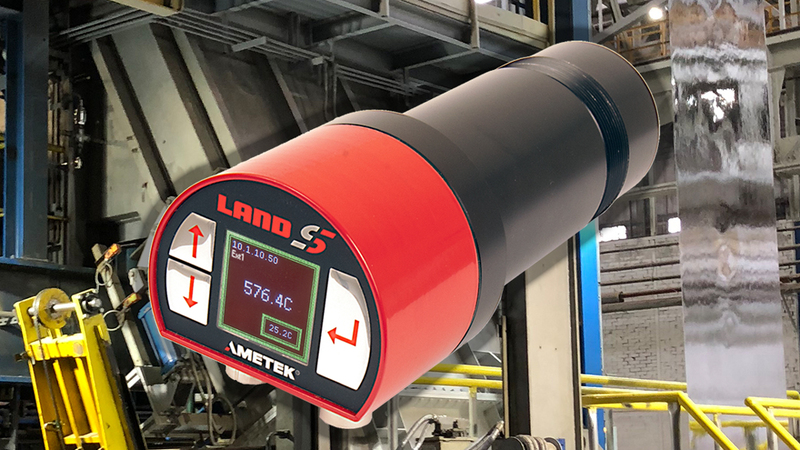 SHEFFIELD, UK, 29 MARCH 2019 - AMETEK Land, a leader in industrial infrared non-contact temperature measurement, has been selected as a finalist in the 7th annual S&P Global Platts Global Metals Awards, which recognizes top performers, industry leaders and innovators based on exemplary accomplishments in numerous categories. AMETEK Land made the shortlist in the “Breakthrough Solution of the Year” category for its innovative new SPOT GS (Galvannealed and Galvanized Strip), an advanced non-contact infrared spot pyrometer, specifically designed for continuous, highly accurate measurements of steel strip temperature during the galvanneal reaction. Launched in November 2018, this smart device ensures the required metal coating characteristics are achieved by providing accurate non-contact temperature measurements for Continuous Galvanizing lines (CGL). Combining the cutting-edge, non-contact infrared technology with specialised software algorithms, the SPOT GS delivers a unique ability to measure the temperature of zinc in the liquid state, allowing it to provide reliable, accurate temperature readings for galvannealed and galvanized steel strip. The new SPOT GS allows rapid furnace optimisation during changes in line speed, substrate and coating weight, enabling automated furnace management that in turn delivers tighter control of product quality. Based on these capabilities, the new SPOT GS should provide customers more success in producing galvannealed and galvanized strip products, including high strength steels to meet the growing demand from the automotive industry. AMETEK Land is proud to provide new products to help the steel industry be more successful in today’s market and in the future. The S&P Global Platts Global Metal Awards final, where winners will be announced, takes place on 16th May at a black-tie dinner in London. S&P Global Platts is the leading independent provider of information and benchmark prices for the commodities and energy markets. Customers in over 150 countries look to their expertise in news, pricing and analytics to deliver greater transparency and efficiency to markets. S&P Global Platts coverage includes oil and gas, power, petrochemicals, metals, agriculture and shipping. S&P Global Platts is a division of S&P Global (NYSE: SPGI), which provides essential intelligence for individuals, companies and governments to make decisions with confidence. For more information, visit www.platts.com. AMETEK Land is a business unit of AMETEK, Inc., a leading global manufacturer of electronic instruments and electromechanical devices. AMETEK Land designs and manufactures a wide range of instruments for industrial non-contact temperature measurement, combustion efficiency and environmental monitoring. For additional information, contact AMETEK Land, Stubley Lane, Dronfield, UK, S18 1DJ, tel +44 (0)1246 417691, fax +44 (0)1246 410585, email land.enquiry@ametek.com, website www.ametek-land.com.